Politicians are quick to propose 'solutions' or spend money, but to solve social and political issues they have to get out to Aboriginal communities and listen to the affected people. At present, most initiatives fail and Aboriginal people are tired of politicians who just keep promising. Number of Aboriginal programmes and activities within the Department of the Prime Minister and Cabinet in 2013-14 . Total funding of these programmes. There are many reasons why government projects and initiatives fail. Government programmes often propose one solution that is then applied to many cases. But such blanket solutions rarely work in Aboriginal affairs. What might work in a community in Western Australia's Kimberley region might not succeed in Central Australia. "We have the bizarre situation where programmes are provided simply because someone thinks they are a good idea," says policy analyst, Sara Hudson . With no evidence of what works and no targeted resources government programmes are nothing but "wishful thinking", Hudson says. In some communities too many service suppliers try to achieve the same thing. Roebourne in Western Australia has a population of 1,150, but there are around 67 local service providers and over 400 programmes funded by both Commonwealth and state governments. Toomelah in New South Wales, with only 300 people, has 70 service providers . Because they were never ended, old programmes have built up over the years, many of which are no longer relevant, while new programmes have been introduced. Such oversupply and duplication happens because the Commonwealth government duplicates state government programs in the areas of greatest need (education and community safety). But it looks as if there is no coordination or pooling of resources. No surprise that areas of shared responsibility have caused confusion and created many difficulties. Secondly, every programme has to be administered by a government entity. In the health sector, some funding arrangements are so complex that up to 42 different sources provide funding . Administration can consume a significant portion of the funds allocated as the following example shows . "Of $1.3 million allocated to another COAG [Council of Australian Governments] trial in the Far-East Kimberley region of Western Australia, only $327,000 was spent on Aboriginal people and programs over two-and-a-half years. "The rest of the money was spent on salaries, travel and other related administrative expenses of the Department of Transport and Regional Services, which administers the program." This equates to 75% of administrative costs. Documents obtained under Freedom of Information laws show that governments waste thousands of dollars towards the end of a financial year "to reduce the department's surplus" . It's a way departments use to avoid a reduced budget in the next financial year. The documents exposed the South Australian governments had spent $360,000 on motorbikes for a program that could have been a positive empowerment and suicide prevention program for young Aboriginal men and boys. But the program was scrapped, and the motorbikes never made their way into communities. They were eventually sold off. "I will honour that commitment [to do things with, and not to, Aboriginal people] not by delivering to Indigenous Australians, but by working with Aboriginal and Torres Strait Islander leaders and their communities across Australia..."
Gracelyn Smallwood, a James Cook University academic who has worked for 45 years in Aboriginal affairs, says there’s still a failure to hold bureaucrats to account for failed multi-million-dollar policies . Installing satellite dishes for local television channels in remote communities might look like a good idea, but what if they need maintenance? At $2.50 per kilometre, a technician might charge $2,500 to drive to the community—each way . Aboriginal affairs: Where are the billions spent? Australian governments pump billions of dollars into Aboriginal policies, health and assistance. Between 2008 and 2011 the total of all Australian Government Indigenous Expenditure (AGIE) portfolio figures were very similar at around A$ 3.4 billion . But in 2011 the Commission found the returns on this investment "dismally poor", the Finance Department "disappointing at best and appalling at worst" . Around 2008 the Western Australian government spent $1.2 billion each year on improving the living conditions of Aboriginal people , but the government's approach was "seriously flawed" because funds were allocated to 22 different agencies with no single person or organisation responsible for improving outcomes. There was "an almost complete lack of leadership in the response by government to the disaster of Aboriginal living conditions", a report by WA coroner Alastair Hope found . An investigation by online magazine New Matilda in 2015 found that 65% of the Indigenous Advancement Strategy (IAS) funding for South Australia went to for-profit and commercial sectors and less than 21% to Aboriginal-led not-for-profits. Case study: "There was all this inefficiency"
NSW Aboriginal Affairs Minister, Victor Dominello, recounts a visit to a small town that he wouldn't identify. He met about 20 of the town's service providers. ''In domestic violence, there were three or four of them doing exactly the same thing, but getting pools of money from different governments and different agencies within governments. "And guess what? They all had a front office; they were all paying rent. There was all this inefficiency. This was for a population of 2500. Those words by the late Chicka Dixon give voice to the concerns of many Aboriginal people. They are sick and tired of politicians who seem to be unable to address Aboriginal issues and achieve tangible beneficial outcomes. Following is an edited extract of Galarrwuy Yunupingu's opinion  on politicians and Aboriginal affairs. Galarrwuy is a long-serving former chairman of the Northern Land Council. 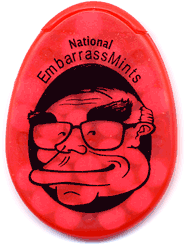 National EmbarrassMints were handed out during the 2007 federal election campaign, the year then-Prime Minister John Howard was voted out of office. Many Aboriginal people were sick of his notorious refusal to say 'sorry' to the Stolen Generations. "Every minister I have known—Labor or Liberal—was no different from any other in this sense [of—often unsuccessfully—trying to find answers within their three-year period in office], even though some of them were my friends. They almost always request the same things and repeat the same things, then consult about the same things; then, by the time they finally have to do something, they leave, get moved or are thrown out of office. "Aborigines too often forget that a politician's full-time responsibility is to themselves and their government. That's their first commitment. Whatever portfolio they receive is just for show. Very few can break the mould and certainly not in Aboriginal affairs. "Aboriginal affairs ministers get a lot of scrutiny, so they are always busy trying to justify their decisions to the rest of their party members in parliament—to keep their reputations intact in the hope of a better appointment—or ducking for cover, worried sick about their jobs and whether they will be re-elected. That's the real situation. "Meanwhile, back in the bush, Aborigines have been sitting in their communities for the past 60 to 70 years waiting for service delivery and the deliverer has never arrived. I see this today with housing, health, education and infrastructure. Everything that has been said and promised in the past few years is still hanging in the wind, floating in the distance like a mirage." "I am seeing now that too much of the past is for nothing. I have walked the corridors of power; I have negotiated and cajoled and praised and begged prime ministers and ministers, travelled the world and been feted; I have opened the doors to men of power and prestige; I have had a place at the table of the best and the brightest in the Australian nation - and at times success has seemed so close, yet it always slips away. And behind me, in the world of my father, the Yolngu world is always under threat, being swallowed up by whitefellas." Sometimes, in critical texts about Australian and Aboriginal politics, you come across "pet Aborigines". This term is used for Aboriginal people who are employed or consulted by non-Aboriginal institutions or companies, but who are not very aggressive or critical when consulted about issues that affect Aboriginal people. "Pet Aborigines" are telling white politicians and bureaucrats what they want to hear. They are token black faces of institutions or companies that remain firmly controlled by non-Aboriginal people. One contemptuous epithet some use for them is “coconut: brown on the outside, white on the inside”. Prof Patrick Dodson, inaugural and long-time chair of the former Council for Aboriginal Reconciliation, shares similar views . "It's not that we haven't had a discussion on matters that concerns us," he says. "We've had plenty of those, we've had marches in the streets, plenty of reports. [But] what we haven't had is a strategic conversation that is facilitated around rules that have got some international application in order to help us all get past the anger and frustration, because we've had all of those reports that have seemed to go nowhere." New South Wales politician Victor Dominello who took over the state's Aboriginal affairs portfolio in 2011 gives some insight into how Aboriginal politics look on the other side. "As soon as I got into the portfolio, I was being absolutely inundated by people saying 'here's a solution, read this book, here's a journal, what about this' and so on," he told an Aboriginal newspaper . "Within a couple of weeks, I thought 'this is crazy, it's going take me years just to read all of this material'. And I think that's part of the problem. Decision makers—people like myself who have to show political leadership—are in their offices reading, reading, reading but not out there and listening to the grassroots." Many know that solutions have to come from Aboriginal people themselves and not bureaucrats. "People react differently when they travel around Indigenous Australia," says Lauren Ganley . "Some just see problems; others see opportunity; and most have questions. The ones you need to watch are those who have solutions." Of all politicians former Labor Prime Minister Paul Keating set what is considered the "high water mark in political honesty"  with his speech in Redfern in 1992, where he bluntly admitted that "we committed the murders. We took the children from their mothers. We practised discrimination and exclusion. It was our ignorance and our prejudice". "Stop giving up, stop being frustrated. Why don't you strengthen your hearts, get a backbone and gather in council and form an Aboriginal government. One with the courage of its convictions to stand up and say enough is enough." "Administrators [assigned to every community] who could withhold welfare would have real power over their charges to get them to do things such as sending kids to school. That would be the stick; the carrot would be the power to spend and employ on local projects to increase Aboriginal capacity to look after themselves: on repairing houses, keeping the place clean, maintaining the 4WDs properly. All to be done without grant applications. Write a one-sentence statement, summarising each view. Who do you think is the speaker for each view? What could be their background? Think of actions government could take following View 1. How well would they support Aboriginal self-determination? Which major event affecting Aboriginal communities was influenced by the premise mentioned in View 2? What would the "avalanche effect" look like that is proposed in View 2?